Torchwood creator Russell T Davies speaking at the British Film Institute in London last night. While John Barrowman (Captain Jack Harkness) reassured fans: “But we never thought of taking it away from you. We never did. 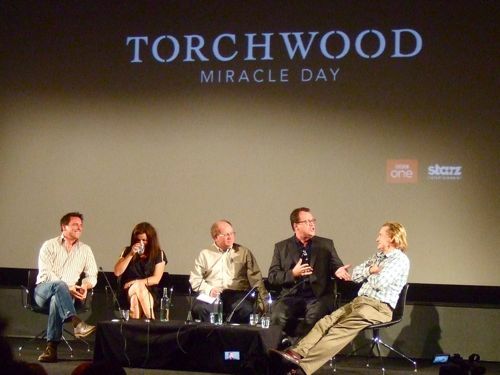 Torchwood: Miracle Day begins on BBC1 in the UK this summer and Starz Originals in the USA on July 8. A 10-part series taking this sci-fi show to another level, without diluting the Welsh ingredients that have made the drama such a hit. We saw the first hour-long episode and a teaser trail for the rest of the season. Followed by an on-stage Q&A with Russell, John, Eve Myles (Gwen Cooper) and Bill Pullman (Oswald Danes). Hopefully you won’t find any major spoilers in this blog, over and above what the BBC has already revealed in their advance publicity for the set up of the series. My transcript of the question and answer session is below – again edited to remove anything that might spoil the plot or reveal character development. If you haven’t read the BBC Press release on the new series, you can do so here. 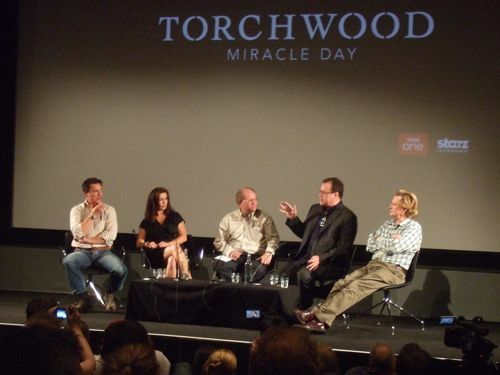 Torchwood: Miracle Day opens in Jacksonville, Florida, with convicted child killer Oswald Danes (Bill Pullman) about to be executed for a truly horrific crime. Just listen out for what he told the police when he was arrested. Miracle Day refers to the day nobody died. And they continue not to die. Day after day, across the world. Not as good news as you might initially think. Causing the world to go into a tailspin. As CIA agents try to solve the mystery of what Torchwood was, its sole survivor Gwen is back in Wales living in an isolated cottage with her husband Rhys (Kai Owen) and baby daughter Anwen. But where is Captain Jack? The opening hour is a stunning piece of television, including some startling scenes. With added lard and helicopters. Two jokes about the Severn Bridge. Plus as chilling a performance as you could wish for from Bill as the hateful killer. The Q&A in front of a packed BFI audience was almost as entertaining as the show itself. So it only seems fair to share a flavour of it below. And the American setting gives it so much more in terms of the scale. It’s absolutely massive? 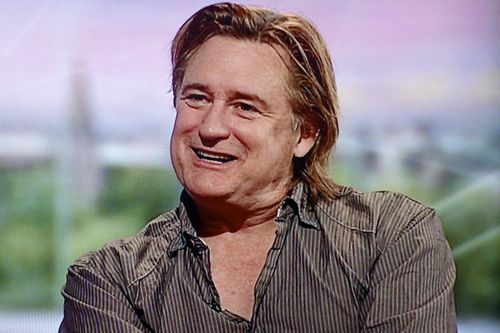 Bill – were you familiar with Torchwood before and what appealed to you about coming on board with these guys? John, where do you think Captain Jack is at the beginning because he’s absent for a while? Is he watching over? Eve – can you describe where Gwen is at the beginning. Obviously she’s in hiding? There’s still that terrific bond between Jack and Gwen. Can you explain that a bit, John? What is it that bonds them? What do you think it is, Eve, that holds them together? Were you ever tempted, Russell, to bring them together romantically? Bill, there’s a very interesting relationship that develops between Oswald and Jack. Can you talk a bit about that without giving too much away? What a wonderful coup to get Bill. Why were you particularly thinking he would be so great for this role? This won’t be the kind of part that we’re almost expecting from the former President of the US? The inversion of the image that some people might have of Bill is very interesting, that he’s playing such a dark part? John, the series has been a huge success for five or six years now. What is it that people have latched on and that makes it endure? People always try and label these things, Russell, but it’s not, strictly-speaking, sci-fi or any other pigeon hole, is it? How would you describe it? Does it give you a bigger canvas to play with, the budget that you’ve got? What was the biggest challenge in filming for you? Was it quite a buzz filming on he Warners Bros lot as well? Were you nervous before filming with Bill for the first time, a big hero of yours? Working with American actors who are familiar to genre fans? 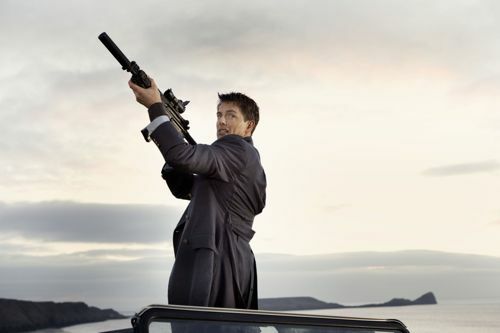 Russell – would you ever consider making just an American Torchwood? Were you ever worried that you might alienate some of the original fans in Britain by going to America? Will the link into Doctor Who ever return? Posted in News and tagged Bill Pullman, Eve Myles, John Barrowman, Miracle Day, Russell T Davies, Torchwood. Bookmark the permalink. Thank you for going through all the hard work of transcribing this – it is greatly appreciated by fans who couldn’t be there from around the world! Do you have a video of the Q&A? The Q&A was filmed by the BFI. Edited highlights should appear on their website in due course. Sorry, but I really don’t like the Americanisation of this new series. It’s lost its charm, which was partly rooted in the fact that it was small-scale, and British. I love Torchwood, and I love Russell T Davies, so I wanted to give it a try, but after seeing the first episode I’m not sure how long I’ll keep watching it. I follow you on Twitter and enjoy your work. I’m also a fellow Chiswick resident, American ExPat, and DW/TW fan. All that background to say I, too, want TW to remain a British show, but I realize it’s unlikely to feel as such in the coming episodes, so I’m hoping it’s just good entertainment. The bigger budget was so very apparent in the first ep, and I enjoyed it — but so was the writing true to the characters of Gwen/Rhys, Jack, and Andy. And in the end, it won’t be the locale that matters to me, but whether I believe the words coming from their mouths are their own. I’m looking forward to the unraveling of Miracle Day.